This new Airbnb apartment is nestled into a retired jetliner parked close to the Amsterdam airport. Airbnb partnered up with KLM Airlines and converted an airplane into a living space and a dream come true for an aviation enthusiast. Their recently launched competition will offer three lucky people the chance to spend a night in this unusual hotel decked out with a master bedroom, seven bathrooms, kitchens, play areas and a private cinema. 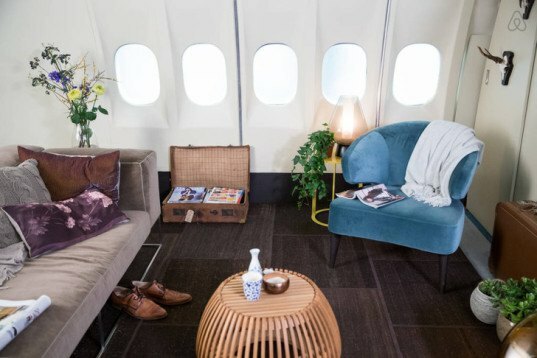 The 4,000-square-foot space will serve as a pop-up hotel for a few days, from November 28 to November 30, 2014, allowing the most nervous of flyers to enjoy being on a plane. Winners of the recently launched competition will receive a round-trip ticket from KLM and a $500 gift card, as well as a chance to stay in this converted KLM plane for one night. The plane, which crossed the world 3,675 times before retirement, boasts a large living room, one master bedroom, two children’s beds, two kitchens, seven small bathrooms and even an on board movie theater. It is located at Amsterdam’s Schiphol Airport, the city’s main air traffic hub. Check www.jumbostay.se, a 747 hotel/hostel at Stockholm Arlanda International Airport since 2008. The 4,000-square-foot space will serve as a pop-up hotel for a few days, from November 28 till November 30, 2014. It will allow the most nervous of flyers to enjoy being on a plane. Winners of the recently launched competition will receive a round-trip ticket from KLM and a $500 gift card. 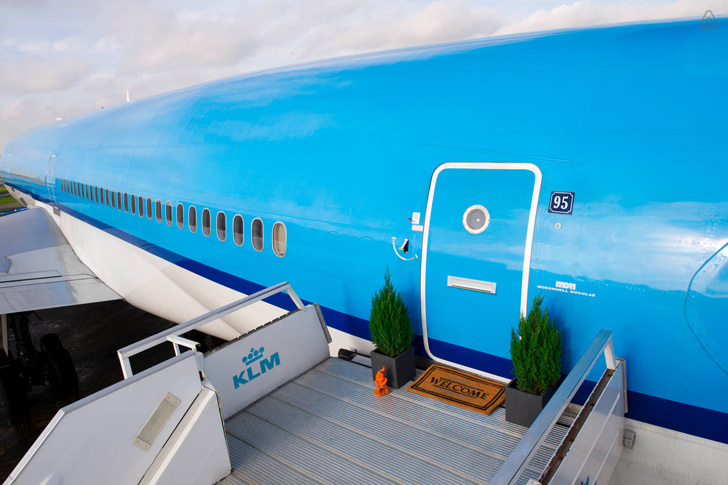 Winners will have the opportunity to stay in this converted KLM plane for one night. The plane, which crossed the world 3,675 times, boasts a large living room, one master bedroom, two children’s beds, two kitchens, seven small bathrooms and even an on board movie theater. It is located at Amsterdam’s Schiphol Airport, the city’s main air traffic hub.